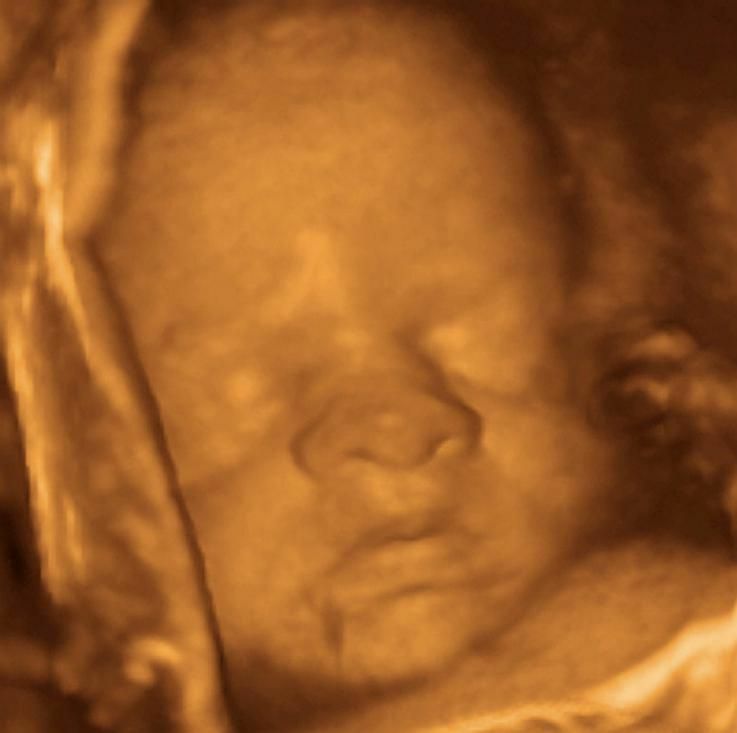 In this 3D scan the baby’s arm is held up next to the face. This type of scan shows external features but also looks inside the baby in 3D so you may see some parts of your baby “through” an arm or leg. Here, the baby’s ear can be seen through the arm. In the uterus and in the first months of his life, your baby relies on your immunity to various infections. Your baby does not have the ability to produce antibodies (which would attack you) in the uterus: he relies completely on you to protect him from infection, not only in the uterus but also after birth. Protection after birth is possible because antibodies from your immune system cross over the placenta into your baby’s bloodstream, while you’re pregnant. If you have immunity to a disease such as measles, mumps, polio, and many other severe infections, your baby will carry your antibodies to these conditions. Childhood immunizations provide immunity to many severe infections. Owing to a large outbreak of whooping cough cases in 2013, a recommendation was introduced that pregnant women between 28 and 38 weeks be vaccinated against this. The immunity your baby acquires from your antibodies is lost with time, so from two months he will require a programme of immunizations. There have been numerous studies over the past few years involving women exercising while they’re pregnant. The bottom line is that exercise performed effectively and safely, at a moderate intensity and in healthy women, is beneficial. As well as being good for your health and making you feel more energized, exercising will get you into great shape for labour and childbirth, which is, in effect, a workout! Exercising will harm my baby if I move too much.Your baby is protected by amniotic fluid and nourished by the placenta. By keeping within safe exercising guidelines, and not doing any high-impact sports or activities where you are at risk of falling or injuries, you are not putting your baby at risk. Exercise will use up some of the nutrients my baby needs.Your baby’s growth will be monitored at antenatal appointments, so you and your midwife will be able to tell whether your baby is growing at a usual rate or whether you should increase your calorie intake. If you’re concerned, increase your calorie intake on the days that you exercise. Doing tummy exercises will harm the baby.You can do abdominal exercises but you should not do them lying on your back in the second and third trimesters. The risk of lying on your back is that your enlarged uterus can press down on the vena cava (the large blood vessel that returns blood to your heart). This causes your blood pressure to fall and compromises the oxygen flow to the baby. The first sign of a problem will be feeling dizzy: if you roll on to your left side, any symptoms should disappear. Don’t hesitate to consult your midwife if you’re concerned.